When it comes to home security, it is inevitable to discuss how to secure cash, jewelry and other valuable items in your home. Home safety statistics reveal cash and jewelries are included in the most common items stolen in burglaries. So many jewelry thefts have been reported these days, besides the familiar Trayvon Martin Jewelry theft, and Lindsay Lohan Jewelry theft. Not only do the large amount of robberies happen in jewelry stores, and jewelries theft movies, they also occur in homes, and the statistics are increasing. There are obvious risks associated with keeping large amounts of cash, valuable jewelry, gem and expensive artwork in your home, but you cannot simply keep everything you own in a storage locker or safe. After all, the whole point of owning a stunning pair of diamond earrings, a Rolex watch or a priceless painting is so you can enjoy it. If you simply lock your valuables away and keep them out of sight, you rob yourself of their enjoyment and make your life a little less fun. If you want to keep your cash, jewelry, and other valuables safe, you should, first of all, protect your home from theft and larceny. A home security camera is turned out to be a great deterrent for thieves. Surveillance cameras used to be costly – so costly that they were used by only the wealthiest homeowners. 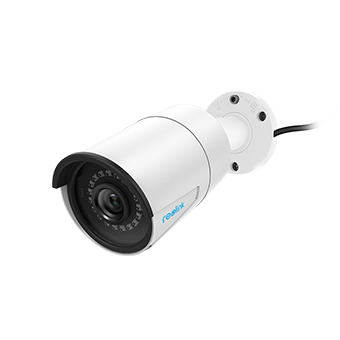 That is no longer the case, and modern security IP cameras are inexpensive and easy to install and use. Installing a security camera at each entrance point can be surprisingly effective, and a great way to keep burglars at bay. Just in case your cash and jewelries were stolen, security cameras provide video evidence for the police to catch burglars, and find your stolen values after a burglary. Keeping your cash and valuables secure at home often means thinking outside the box. If you want to keep your valuable items safe from burglars and home invaders, sometimes the best strategy is to hide those items in plain sight. If a burglar breaks into your home, you can be reasonably certain the first thing they will look for is a security safe. The bad guys know that safes are where rich people keep their most valuable items, and the presence of a home safe is sure to get their attention. Unfortunately, many home safes are not quite as unbreakable as they profess to be. There are hundreds of videos showing just how easy it is to get into the average safe, so if you want to prevent your money from being stolen, you need to think outside the box (and the safe). Here is a list of better places to stash your cash at home. Inside your favorite book. Use your spare cash to mark a page in your favorite tome – just keep the bills from sticking out. Then put the volume back on your bookshelf. Thieves will be none the wiser. In a freezer bag. This gives a whole new meaning to cold cash. Just place your bills in a freezer bag, close it securely and place the stash at the back of your freezer. Even the most curious thief is unlikely to go through your fridge. In an old Mason jar or plastic bottle. An opaque plastic bottle or old Mason jar makes a great hiding place for cash. You can stick those cash-filled jars and bottles just about anywhere, from your garage to the kitchen drawers. At the bottom of your sock drawer. If you have a sock that has seen better days, just turn it into a safe for your spare cash. Just roll up the bills, stuff them into the toe of the sock and place it at the back of the sock drawer. In the pocket of an old blazer. Just pick a blazer, shirt or other piece of clothing and use the pockets to store your extra cash. A burglar is unlikely to search for cash in your closet. In your filing cabinet. If you need to keep cash in your home office, hide it in plain sight by picking out a particular file folder and placing the bills inside. You will know where the money is, but no one else will. Buried in your backyard. 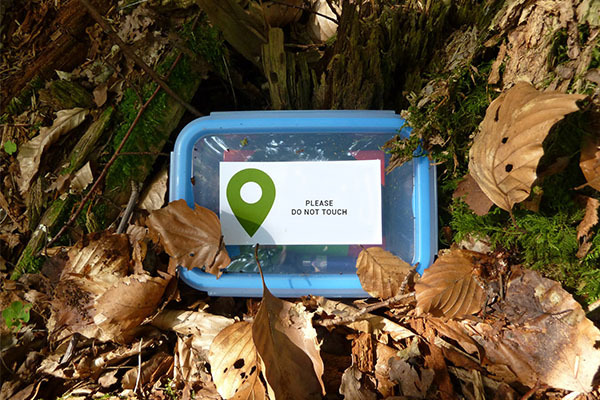 If you want to embark on a real treasure hunt, you can place your extra cash in a secure jar or plastic container and bury it in your backyard. Just make sure you have a marker to go by when it comes time to dig the booty up. If you have a lot of expensive jewelry, the worst place to keep it is in a jewelry box. The home safe may be the first thing a burglar will look for, but the jewelry box is probably the second. Feel free to use your ornate jewelry box for your costume jewelry, but be a bit more creative when it comes to your expensive gold, silver and jewels. In a fake bottom of a potted plant. To the casual observer it looks like a vase of fresh flowers or a pot of greenery, but on closer inspection there is a false bottom that holds your designer watch, diamond pendant or other expensive jewelry item. In an envelope taped to the bottom of a dresser drawer. For convenience sake it is great to hide your expensive jewelry in the bedroom, and the bottom of a dresser drawer is the perfect hiding spot. Just place your favorite pieces in an envelope, seal it up and tape it securely to the bottom of the drawer. Inside an old coffee cup. Chances are the person who burglarizes your home will not take the time to make a pot of coffee. That makes coffee cups great hiding places for your jewelry. Just choose a cup, add your favorite pieces and place them at the back of your kitchen cabinet. Inside a fake book on your bookshelf. The fake book may be a bit of a cliché, but as long as you choose one that looks real you should be fine. 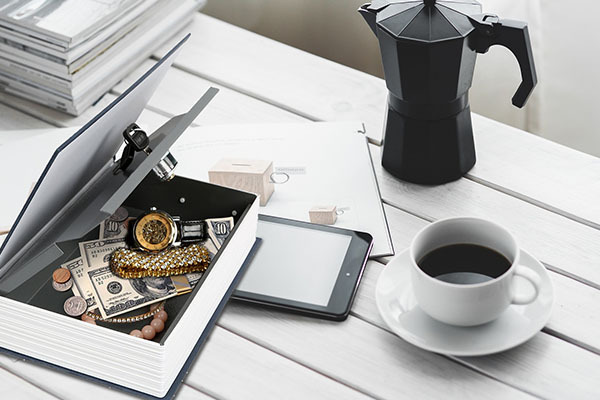 A large tome will give you plenty of room to store everything from your Rolex watch to your expensive diamond cufflinks. Besides installing home security cameras, hiding your cash and jewelries, there are also other smart ways to secure your cash, jewelry and other valuables and protect them from break-ins and home theft. The easiest and the most direct way to secure your cash from home break-ins and theft is to take it to the bank. If you lose cash, the money is probably gone forever. By placing your excess cash in the bank you can protect it from loss and reduce the risk of a break-in. Jewelry insurance usually covers accidental damage, loss and theft. When jewelries and other values are insured, you’ll have them repaired or replaced. Never try your luck and raise your awareness for cash and jewelry larceny. The insurance won’t cost you too much, which is only 1% to 2% of the total value of your jewelry. Do remember to keep cash, jewelries, gems, and other valuables safe at home during festivals and holidays. When you are relaxed and enjoying holidays, burglars and robbers never rest. If you come up with more creative and genius tips and tricks about cash and jewelry protection, please share them along with this article to let more people know. This entry was posted in Expert Safety Tips and tagged home security tips, Secure Back Door, secure cash. A blog writer and content marketer by day, and a reader by night. A coffee addict, and lover of cool stuff and new tech. She's been diving into home security industry from the last two years, and sharing practical security tips and tricks. Love the idea of being warm and secure, that's exactly what home should be. Thank for sharing these creative ways to protect my jewelry and other valuables. I am a jewelry professional and have special pieces that I want to make sure they don’t come up missing.